SAP Customer Checkout is the simple point of sale system for small and medium businesses and integrates perfectly with SAP Business One. Providing a central overview of all sales data, SAP Customer Checkout is able to take cash and card payments, plus transactions and invoicing. A POS systems need to be versatile and to simplify workflows. With direct connections to inventory control systems are able to offer extra benefits, such as detailed real-time analyses. When an item arrives in stock, it can go on sale immediately. In the fast-moving retail sector, planning for purchasing must be precise to prevent bottlenecks. Real-time IT systems that combine information from outlets with your supply chain management make this possible. You can evaluate your data at any time and know exactly how much to order and which products are particularly profitable. SAP Customer Checkout simplifies sales by giving your sales staff all the information they need. Customers can pay in cash, with standard debit and credit cards or vouchers – either at stationary cash registers or via staff members’ hand-held tablet PCs. Special offers like discounts, loyalty cards and apps are easy to integrate in your Point of Sale application. You can also personalise your sales system. The solution recognizes regular customers by their customer number or by scanning a QR code directly on smartphones or tablets. You can print receipts as usual, with any type of printer. At the end of the day, the solution produces a detailed overview of the balance of cash, card payments and vouchers. Potential discrepancies are easy to detect, investigate and trace. SAP Customer Checkout can be installed on all standard cash register infrastructures and is optimised for use with SAP Business One. You have access to the data, anytime and anywhere. Even if your Internet connection goes down, your employees can continue working normally. The invoice data is saved and sent to the ERP system as soon as the connection is available again. 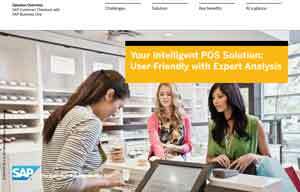 SAP Customer Checkout can be used as a standalone solution. However, its special advantages really come into play when combined with the SAP Business One. This pools all of your information in one location. When products or prices change, outlets can be notified immediately. Transactions are transmitted directly to warehouse management and accounting.